These pop art suspenders can be used to quickly and easily create a comic book themed costume for Halloween or comic book conventions. 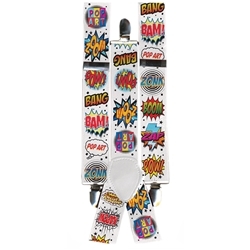 The pop art suspenders are colored as pictured and features different comic book style action art all along the suspenders. Includes one pair of suspenders. Pair these suspenders up with other pop art and comic book themed costume accessories to create the right look for you.